Now everyone can prepare a chef’s salad, mixed salads, fruit salads, in just a few minutes, with the Salad Chef. It has straining baskets with a centrifugal action so as to dry the food in just a few seconds. You can also prepare delicious soups and stews, amazing starters and many more.Salad Chef Hot As Seen On TV , you can prepare a chef’s salad or mixed salads or fruit salads in minutes. Salad Chef not only helps you rinse and spin salads, but you can also slice, dice, julienne, cube and shred fruits, vegetables, some meats and more. 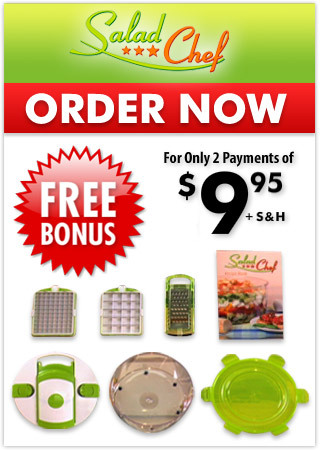 You can prepare a Chef’s Salad or mixed salads or fruit salads, in just a few minutes! The Salad Chef also comes with catching and storage containers that make your life even easier since they attach right to the Salad Chef machine. Salad Chef is the fastest salad and food preparation system.With Salad Chef everybody can prepare fabulous salads and so much more in no time. Mixed salads,fruit salads,potato salads,pasta salads-any salad you like. Original germany design, Salad Chef is a revolutionary salad making system that will help you prepare hundreds of different salads, appetizers,meals, snacks, deserts and more. Salad Chef As Seen On TV slice it. Spin it. Seal it. Store it and serve it… all in one! with the salad chef anyone can make the sensational chef salads… mixed salads.. Fruit salads… pasta salads.amazing salads from start to finish in just one snap. Salad Chef is the fastest salad and food preparation system.With Salad Chef everybody can prepare fabulous salads and so much more in no time. Mixed salads,fruit salads,potato salads,pasta salads-any salad you like. Save prep time, save cleanup time, eat healthy. The Salad Chef is the world’s fastest salad making device. You can dice, slice, cube, shred, julienne, grate, mix, serve, transport and store all in the same container. The slicing blades are made of razor sharp never dull hardened stainless steel. The container is crystal clear, durable, shatterproof and kitchen tested to last for years. And it’s dishwasher safe so cleanup is a snap.